if you have rice leftovers, don't need to worry. 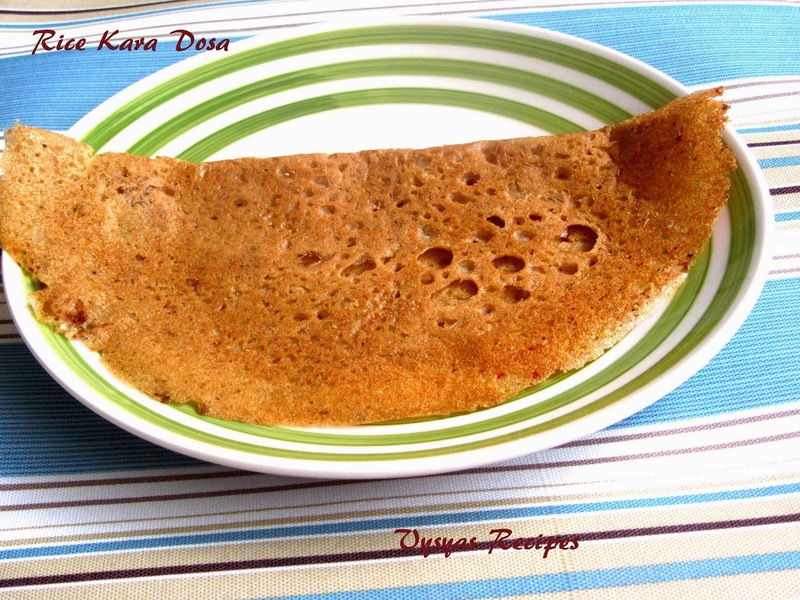 you could make delicious, tasty and crispy kara dosa. This dosa is made with rice, toor dal, cooked rice and some spices.Adding rice gives additional softness to dosa.Now we learn to make crispy soft and tasty dosa. Soak Raw Rice and Toor dal together for overnight or 3 to 4 hrs. Grind soaked Raw Rice,Toor dal,cooked rice,cumin seeds,pepperseeds,curry leaves,tamarind,hing,Red chillies, fennel seeds and salt to gether with needed water. As soon as you prepare the batter start preparing dosa's not necessary to ferment. [Consistency of batter should be moderate not too thicker or thinner]. When tawa is heat, pour the ladle of batter, from outside of tawa like a ring, then fill inner big gaps. drizzle some oil, when it is cooked on one side, and edges turns crisp, then flip the dosa.When cooked on both the sides remove from tawa. you can chop the onions and add it to batter, to prepare dosa which gives additional taste to dosa.(optional). if you have drumstick leaves chop it and add to batter, before making dosa's. Innovative method to use left over rice ... one doubtb...raw rice means uncooked rice or pacharisi ? That is a lovely idea to use left over rice. I am sure going to try this. Delicious & innovative recipe................useful clicks..